For some parts of Europe the “Beast from the East Mk II” is on its way and we face a weekend of bitter cold, snow and disruption. However, for some very lucky athletes, they are heading to the Canary Islands and the early season sunshine of Gran Canaria. An interesting selection of Elite athletes will, using this race, start their journey around Europe, collecting points and medals as they travel. 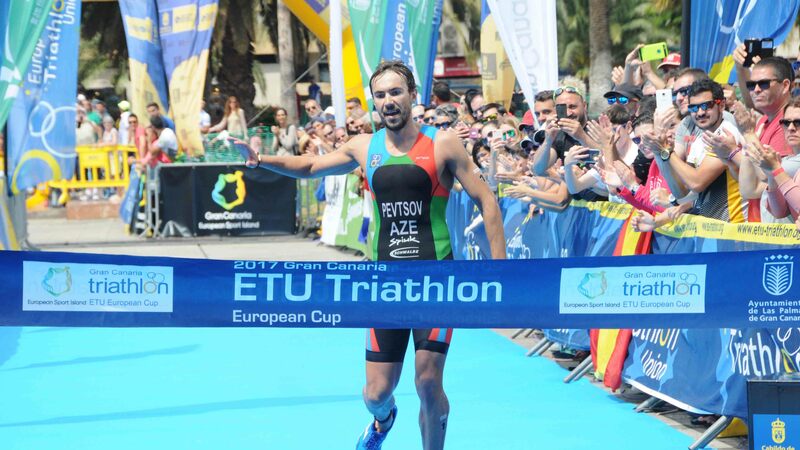 Alongside the Elite Race is a huge Open race, organised by FETRI, the Federación Española de Triatlón, providing Age group athletes with a fantastic opportunity to race a closed circuit, top-class event, with a blue carpet finish and all the razzamatazz that goes with an ETU European Cup. Age Group athletes – keep your eyes open for further opportunities during the year. We know already that you can race in Weert at the test event for the 2019 ETU Triathlon Standard Distance Championships and at Valencia later in the year and we are sure that more organisers will look to opening up their races to you. More good news: we have live feeds for both Elite races. Just click this link to watch the race live (no subscription needed). Who should we be watching out for? Well, the Women’s race is going to be a critical one for some who are coming back from injury. Wearing #1 is Team GB’s Jodie Stimpson. With only 4 races last year, she still managed a podium silver in Abu Dhabi with a race to the line against Kiwi Andrea Hewitt. A good silver medal there was not to be repeated during a tough year but an end of season top ten in Rotterdam showed us all that she was back on form and her absence from the Commonwealth Games denies her the chance to defend her crown, won in Glasgow. She will face stiff opposition from those seeking to push her to the limit and with last year’s 4th placed athlete, Italy’s Giorgia Priarone and Spain’s Anna Godoy Contreras there to push, she will hope to have Giorgia Taylor-Brown, reigning ETU U23 champion, close by to work the bike. Taylor-Brown’s victory in Madrid last year showed her impressive biking and running could destroy an ITU World Cup field. She is very definitely one to watch. Making regular appearances in the top ten is Justine Guérard FRA. Her Malmö victory last year put her on the podium map and the Poissy team member was not put off by the recent snows in southern France. She has clocked up some good run sessions, added to pool work in advance of the 2018 season. With a bronze and silver medal at the end of last year, Petra Kuříková CZE closed a 2017 season that saw her place 14th in both Kitzbühel and Düsseldorf. A season finale in Melilla saw Kseniia Levkovska AZE place 7th in a tough race after earlier being stung by a jellyfish. Her 17th place here last year was followed up with a victory in Larache and then a 4th in Funchal and Hong Kong. Proven speed in the water and good pace on the run, she can push the pace here. Another one to watch is the young Dutch athlete, Kirsten Nuyes. She can place well in the swim and then ride like the wind. If she can work with the leaders on that bike course, there might be celebrations in the Netherlands. For a full start list, please click this link. Amongst the Elite Men, we see the defending title-holder, Rostislav Pevtsov AZE. Consistently returning top ten places, he really is the one to watch but behind him are two athletes that will without a doubt make it a hard day at the office. Spain’s Uxío Abuín Ares. He beat Pevtsov into 4th place in Melilla last year at the end of a long season and had the edge on him in Kitzbühel, losing out in the Sprint in Düsseldorf. With the home crowds cheering him on, this could be an exciting showdown. Watch out too for the young Swiss athlete, Adrien Briffod. His victory in Cagliari last year, racing against the Elite, was followed by a World U23 bronze in the duathlon in Penticton and an 8th place in Abu Dhabi. Whilst these three are the ones to watch, there are any number of other athletes who can really force the pace and the Brits have some young, determined and gifted athletes who will want to make an early season impression on the results. Amongst them we give a massive, “Welcome Back!” to Alex Yee GBR. Having posted a 13:37:60 for 5k in May last year, putting him #4 in the all-time UK rankings, he suffered a horrific crash in Cagliari. It was broadcast on Facebook Live. We all held our breath. He broke ribs, fractured his vertebrae and suffered a collapsed lung, missed his exams and started a slow process to rebuild his broken body. His first real test came in February in typically awful conditions, when he raced the British Universities Cross Country Championships. Early in the race he kicked and broke the challenge behind him. This breakaway, despite being spiked early on in the race, took him to victory by a comfortable margin and clearly showed us all that his fitness was impressively back on form. Sadly, he missed the awards ceremony as he was in hospital having his foot repaired. You can read the full article here, on Athletics Weekly. Look at athlete #23. Most recently he has been behind the camera, working for ITU but he may well make some of the younger athletes work much harder than they expect. Good luck Tommy! For the full Elite men’s Start List, please click this link.